I can be as cynical as anyone about befuddled, unthinking, unresponsive bureaucrats. One thoroughly surprised me last evening. I got an almost instantaneous reply…from a human…with a resolution to a complaint. I felt like a panel in one of Keith Knight’s Life’s Little Victories. It was just over a nickel. I figured the rules-are-rules, that’s-the-way-it-is forces would likely ignore me or eventually tell me to go away. Instead, I got a callback within 10 minutes of emailing a complaint. Maybe it was the French connection. 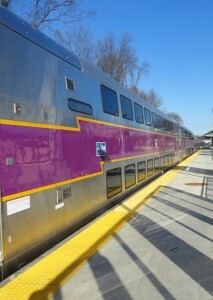 Keolis manages the commuter rail here, including fare collection and ticket issuing on trains. After a terrible winter with many skipped or late trains, they try to be efficient and revenue producing. As of July 1, the MBTA hiked fares roughly 5%. A few fares fell on one side or another of a price fence. The one at issue here was the zone 1A train fare for those with a senior card, i.e. me. The rate as of July 1 went to $1.10 one way from my Fairmount stop to South Station. Recently and suddenly, the conductors have adamantly demanded not $2.20 for a round trip, rather $2.25. There’s a bureaucratic logic to that, in that senior prices are almost all 50% that of regular adult tickets. Yet, it’s not $1.125 one way, just $1.10. Someone had clearly trained the conductors poorly on this fine point. One after another told me strongly that the round trip was $2.25. They just knew it. I on the other hand had seen the initial price hike info, including the posters that appeared for weeks in each train with the $1.10/$2.20 info. I admit that today’s nickel is yesterday penny. When I was wee, it would buy a five-stick pack of gum. Not in 2016. 5¢ pieces are earning the same disdain as 1¢ ones. They are more of an inconvenience than currency. She must be used to alter kakers and other sticklers. She didn’t laugh or tell me to drop dead. She immediately said $2.20 and then verified that by calling up the ticket on her database and computer screen. Sure enough, $2.20. Last evening, I used the MBTA site’s contact-us tab. I sent my whiny complaint by their form.